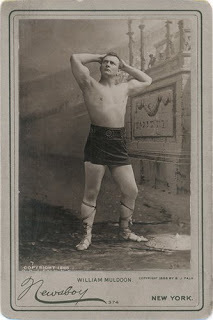 02-06-1877: William Muldoon wins a Greco-Roman championship from Andre Christol. Muldoon also defeats Jim Owens. 07-1877: James McMahon wins the Canadian Collar & Elbow title from James Lafell of British Columbia. 1877: Richard K. Fox buys the National Police Gazette. 1877: A supposed “mysterious prehistoric human body” is dug up in the town of Beulah, Colorado. The “body” is later discovered to be a hoax but it was dubbed “The Solid Man” after William Muldoon.